Ian McGeown is an Aresty Undergraduate Research Assistant with the Eagleton Center for Public Interest Polling, and is a sophomore at Rutgers University. Liz Kantor is an Aresty Undergraduate Research Assistant with the Eagleton Center for Public Interest Polling and a School of Arts and Sciences Honors Program at Rutgers University in the class of 2016. Max Mescall is a research intern at the Eagleton Center for Public Interest Polling and a junior at Rutgers University. In recent years, the Internet has become a wealth of information on nearly every topic. For example, many politicians and institutions have a presence on a host of social media sites – such as Facebook, Twitter and YouTube – as do newspapers, who more and more frequently put their own content online. Notable generational gaps in how much news is obtained through Internet sources exist, however (for a great summary of generational differences in various online activities in general, see here: http://www.pewinternet.org/Infographics/Generational-differences-in-online-activities.aspx). The recent gubernatorial election in New Jersey highlights this trend. Unsurprisingly, younger generations tended to get information on the 2013 governor’s race in New Jersey through social media sites more than older generations. For 18-39 year olds, for example, 16 percent got information about the race on Twitter, while only 6 percent of 40-64 year olds did the same; no one over the age of 65 received information from the same site. Facebook also generated a similar trend, with 32 percent of those under 40 obtaining some information about the race from the site. This is compared to only 21 percent of those between the ages of 40 and 64, and 11 percent of people 65 and older, who got information from here. Meanwhile, 26 percent of people between 18 and 39, 11 percent of those between 40 and 64, and 10 percent of people over 65 years old reported getting information off of the video sharing website YouTube. This trend ceases, however, when it comes to “traditional” online media sources, such as online newspapers and blogs. Here, there is only a small 5-point difference between the youngest and oldest age brackets, with 15 percent of the under 40 crowd reporting that they got information on the gubernatorial election from these sources, while 10 percent of those between the ages of 40 and 64, and 13 percent of those 65 and over, state the same. 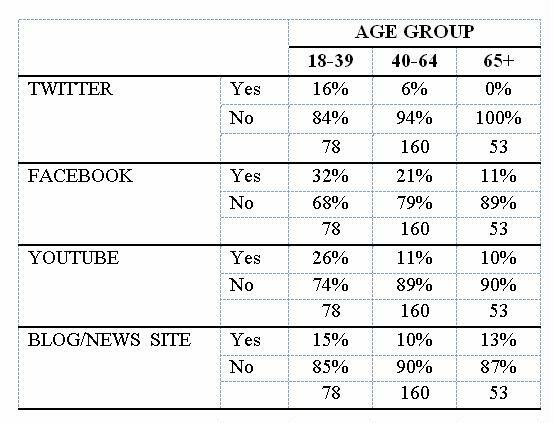 These numbers suggest that it’s not necessarily using the Internet itself for election information that promotes generational gaps but rather the types of sources being accessed on the Internet. In sum, among those who used the Internet to get information on the governor’s race, younger voters were most likely to use social media sites – particularly Facebook – more than traditional news outlet sites or blogs, as well as more likely to use social media than older voters. Yet it also seems that everyone is using Facebook the most overall, as it was the main source of information for the governor’s race among 40-64 year olds and a close second for Internet users who are 65 and over; these Internet users in the oldest age group tended to go to blogs and news sites slightly more for their election information. Twitter was the least popular among Internet users within each age group. Therefore, the Internet is making it increasingly easier to get news and information about politics, but not everyone chose this method during the gubernatorial campaign season this past year – and even among those who did, differences remained in what types of sites they choose to access for information once online. These differences are especially evident when analyzing voters by age.